3 Squares Produce Farm s grow their own fruit, vegetables and herbs. Four generations of family participate to one degree or another in the farming or business side of the farm. 3 Squares Produce is one of a very few orchards in Utah growing fruit using organic methods and standards. This 10-acre farm is made up of multiple locations in Davis and Salt Lake Counties. Their orchard in Bountiful has been farmed for 78 years. They are farming in West Valley for the first time this year, they have been working their remaining parcels from 2 to 5 years. Although they are not certified organic, everything is grown using organic methods and organic standards. Ralph Larsen still lives on a remnant of the Bountiful farm his parents bought in 1938. He has been farming since he was nine and is now 87. Jack Wilbur has been farming with Ralph for 16 years and alone at other locations for six years. Additional farming endeavors include ownership of a portion of a family wheat farm in Idaho, but is it not actively farmed by 3 Squares. 3 Squares offers 35 CSA Shares in Salt Lake and Davis Counties. Pick up locations are in Salt Lake, Murray, South Jordan and Bountiful. Although it isn’t standard, home delivery is possible on a case by case basis. They offer two share sizes. Half share is about one peck in volume. Full share is about one half bushel in volume. Fruits, vegetables and herbs come standard. This year they will offer one small jar of honey (from bees at our property) standard in the share. Items that must/should remain cold are bagged. other items are bagged or boxed. Eggs are available as an add-on item. Shares cost either $200.00 - $400.00. Eggs are an additional $45.00 or $90.00. They had four people work for shares in 2015. This is a possibility for others on a case by case basis. 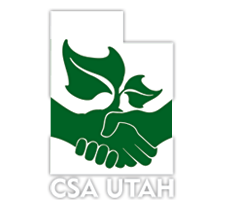 Learn more about them here http://csautah.org/find-a-csa/3-squares-produce.html.